Upcoming Webinar Thurs 1/24: Databases Gone Serverless? Please join Percona’s Senior Technical Manager, Alkin Tezuysal, as he presents Databases Gone Serverless? on Thursday, January 24th, at 6:00 AM PDT (UTC-7) / 9:00 AM EDT (UTC-4). In order to learn more, register for this webinar on Databases Gone Serverless. Our Percona Server for MySQL 8.0 software is the company’s free, enhanced, drop-in replacement for MySQL Community Edition. The software includes all of the great features in MySQL Community Edition 8.0. Additionally, it includes enterprise-class features from Percona made available free and open source. 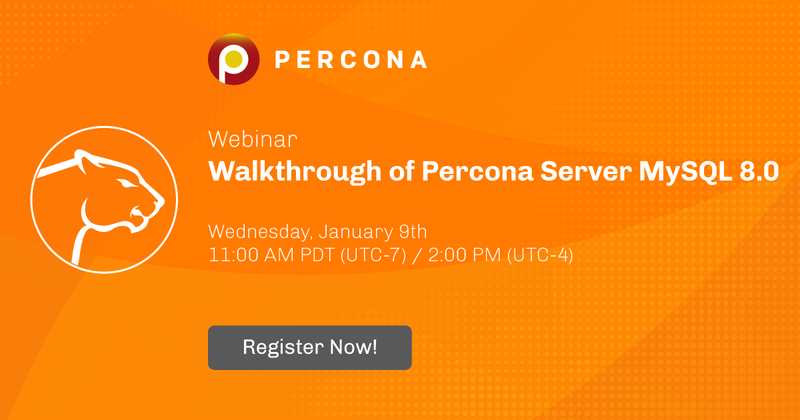 Thousands of enterprises trust Percona Server for MySQL to deliver excellent performance and reliability for their databases and mission-critical applications. Furthermore, our open source software meets their need for a mature, proven and cost-effective MySQL solution. 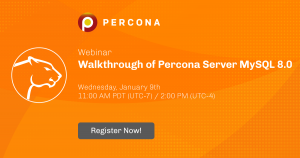 In sum, register for this webinar for a walkthrough of Percona Server for MySQL 8.0. Register for MySQL 8 for Developers to learn how MySQL’s new features can help your application and more. I was really surprised. First, and the most important, id is a primary key and the rand() function should produce just one value. How come it returns two rows? Second, why is the response time 0.30 sec? That seems really high for a primary key access. So it is a primary key, but MySQL does not use an index, and it returns two rows. Is this a bug? Proceed using the same algorithm with the remaining rows. In other words, as the value of rand() is not known (not evaluated) beforehand, so we can’t use an index. And in this case – rand() function – we have another interesting consequence. For larger tables with an auto_increment primary key, the probability of matching the rand() value and the auto_increment value is higher, so we can get multiple rows back. In fact, if we read the whole table from the beginning and keep comparing the auto_inc sequence with “the roll of the dice”, we can get many rows back. That behavior is totally counter-intuitive. Nevertheless, to me, it’s also the only correct behavior. This would meet our expectations. So, I wanted to see how it works with MySQL stored functions if they are assigned “deterministic” and “not deterministic” keywords. First, I wanted to “trick” mysql and pass the deterministic to the stored function but use rand() inside. Ok, this is not what you really want to do! So MySQL optimizer detected the problem (somehow). MongoDB 4.0 is around, and there are a lot of new features and improvements. In this article we’re going to focus on the major feature which is, undoubtedly, the support for multi-document ACID transactions. 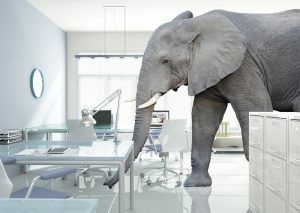 This novelty for a NoSQL database could be seen as a way to get closer to the relational world. Well, it’s not that—or maybe not just that. It’s a way to add to the document-based model a new, important, and often requested feature to address a wider range of use cases. The document model and its flexibility should remain the best way to start building an application on MongoDB. At this stage, transactions should be used in specific cases, when you absolutely need them: for example, because your application is aware of data consistency and atomicity. Transactions incur a greater performance cost over single document writes, so the denormalized data model will continue to be optimal in many cases and this helps to minimize the need for transactions. Single writes are atomic by design: as long as you are able to embed documents in your collections you absolutely don’t need to use a transaction. Even so, transaction support is a very good and interesting feature that you can rely on in MongoDB from now on. ACID properties are well known in the world of relational databases, but let’s recap what the acronym means. Atomicity: a group of commands inside the transaction must follow the “all or nothing” paradigm. If only one of the commands fails for any reason, the complete transaction fails as well. Consistency: if a transaction successfully executes, it will take the database from one state that is consistent to another state that is also consistent. Sessions were deployed in version 3.6 in order to run the retryable writes (for example) but they are very important, too, for transactions. In fact any transaction is associated with an open session. 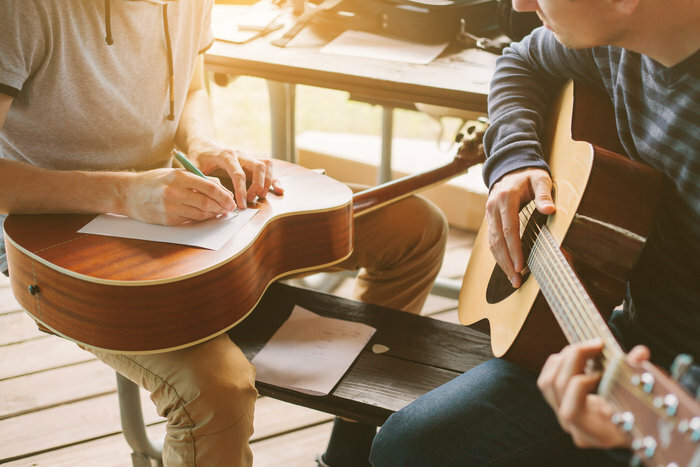 Prior to starting a transaction, a session must be created. A transaction cannot be run outside a session. At any given time you may have multiple running sessions in the system, but each session may run only a single transaction at a time. You can run transactions in parallel according to how many open sessions you have. Note: in the following examples, we use two different connections to create two sessions. We do this for the sake of simplicity, but remember that you can create multiple sessions even inside a single connection, assigning each session to a different variable. Create a new collection, and insert some data. As you might notice, since the transaction is not yet committed, you can see the modifications only from inside the session. You cannot see any of the modifications outside of the session, even in the same connection. If you try to open a new connection to the database, then you will not be able to see any of the modifications either. Now, commit the transaction and see that you can now read the same data both inside and outside the session, as well as from any other connection. When the transaction is committed, all the data are written consistently and durably in the database, just like any typical write. So, writing to the journal file and to the oplog takes place in the same way it as for any single write that’s not inside a transaction. As long as the transaction is open, any modification is stored in memory. Let’s test now the isolation between two concurrent transactions. Update the document on connection #1 to record Heidi’s document. Add the gender field to the document. The two transactions are isolated, each one can see only the ongoing modifications that it has made itself. As you can see the second transaction still sees its own modifications, and cannot see the already committed updates of the other transaction. This kind of isolation works the same as the “REPEATABLE READ” level of MySQL and other relational databases. When two (or more) concurrent transactions modify the same documents, we may have a conflict. MongoDB can detect a conflict immediately, even while transactions are not yet committed. The first transaction to acquire the lock on a document will continue, the second one will receive the conflict error message and fail. The failed transaction can then be retried later. Create a new transaction in connection #1 to update Heidi’s document. We want to change the name to Luise. Let’s try to modify the same document in a concurrent transaction in connection #2. Modify the name from Heidi to Marie in this case. We received an error and the transaction failed. We can retry it later. each commit operation is a retry-able write operation regardless of whether retryWrites is set to true. The drivers retry the commit a single time in case of an error. Transaction support in MongoDB 4.0 is a very interesting new feature, but it isn’t fully mature yet, there are strong limitations at this stage: a transaction cannot be larger than 16MB, you cannot use it on sharded clusters and others. If you absolutely need a transaction in your application use it. But don’t use transactions only because they are cool, since in some cases a proper data model based on embedding documents in collections and denormalizing your data could be the best solution. 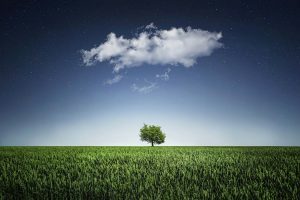 MongoDB isn’t by its nature a relational database; as long as you are able to model your data keeping in mind that it’s a NOSQL database you should avoid using transactions. In specific cases, or if you already have a database with strong “informal relations” between the collections that you cannot change, then you could choose to rely on transactions. If your application or part of your application is sensitive to stale reads, then this is something to consider when implementing HA/load balancing. The most common incorrect approach that we see in Percona support is when customers add a sleep between the write and the read. This may work in some cases, but it’s not 100% reliable for all scenarios, and it can add latency when there is no need. Let’s review an example where by the time you query your slave, the data is already applied and you have configured your transaction to start with a SELECT SLEEP(1). In this case, you just added 1000ms latency when there was no need for it. Another example could be when the slave is lagging behind for more than whatever you configured as the parameter on the sleep command. In this case, you will have to create a login to keep trying the sleep until the slave has received the data: potentially it could take several seconds. By default, MySQL replication is asynchronous, and this is exactly what causes the stale read. However, MySQL distributes a plugin that can make the replication semi-synchronous. We have seen customers enabling it hoping the stale reads problem will go away. In fact, that is not the case. The semi-synchronous plugin only ensures that at least one slave has received it (IO Thread has streamed the binlog event to relay log), but the action of applying the event is done asynchronously. In other words, stale reads are still a problem with semi-sync replication. Consists of executing a SHOW MASTER STATUS right after your write, getting the binlog file and position, connecting on a slave, and executing the SELECT MASTER_POS_WAIT function, passing the binlog file and position as parameters. The execution will block until the slave has applied the position via the function. You can optionally pass a timeout to exit the function in case of exceeding this timeout. Requires an application code rewrite. It’s a blocking operation, and can add significant latency to queries in cases where a slave/node is too far behind. Requires GTID: this is similar to the previous approach, but in this case, we need to track the executed GTID from the master (also available on SHOW MASTER STATUS). Works on all MySQL versions. It’s a blocking operation, can add significant latency to queries in cases where a slave/node is too far behind. As it requires GTID, it only works on versions from 5.6 onwards. Consists of enabling relay_log_info_repository=TABLE and sync_relay_log_info=1 on the slave, and using a similar approach to option 1. After the write, execute SHOW MASTER STATUS, connect to the slave, and query mysql.slave_relay_log_info , passing the binlog name and position to verify if the slave is already applying a position after the one you got from SHOW MASTER STATUS. This is not a blocking operation. In cases where the slave is missing the position you require, you can try to connect to another slave and repeat the process. There is even an option to fail over back to the master if none of the slaves have the said position. In cases of checking multiple slaves, this can add significant latency. Requires Galera/Percona XtraDB Cluster: Consists of setting a global/session variable to enforce consistency. This will block execution of subsequent queries until the node has applied all write-sets from it’s applier queue. It can be configured to trigger on multiple commands, such as SELECT, INSERT, and so on. Easy to implement. Built-in as a SESSION variable. 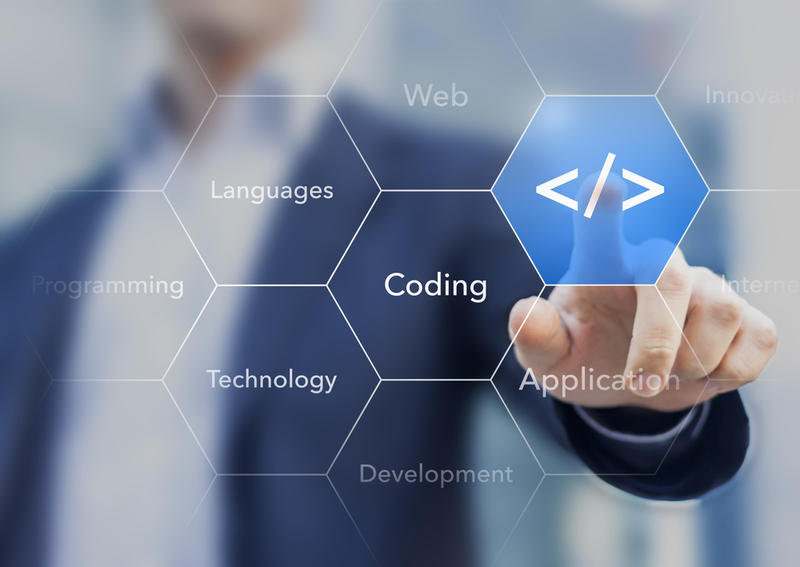 Requires an application code rewrite in the event that you want to implement the solution on per session basis. It’s a blocking operation, and can add significant latency to queries if a slave/node is too far behind. Requires MySQL 5.7 and GTID: MySQL 5.7 returns the GTID generated by a commit as part of the OK package. ProxySQL with the help of binlog readers installed on MySQL servers can keep track of which GTID the slave has already applied. With this information + the GTID received from the OK package at the moment of the write, ProxySQL will decide if it will route a subsequent read to one of the slaves/read nodes or if the master/write node will serve the read. Transparent to the application – no code changes are required. This still a new feature of ProxySQL 2.0, which is not yet GA.
Undesirable issues can arise from adding HA and distributing the load across multiple servers. Stale reads can cause an impact on applications sensitive to them. We have demonstrated various approaches you can use to overcome them. Like MySQL, having too many indexes on a MongoDB collection not only affects overall write performance, but disk and memory resources as well. While MongoDB holds predictably well in scaling both reads and writes options, maintaining a heathly schema design should always remain a core character of a good application stack. Aside from knowing when to add an index to improve query performance, and how to modify indexes to satisfy changing query complexities, we also need to know how to identify unused indexes and cut their unnecessary overhead. From this information, if the ops counter is zero for any index, then we can assume it has not been used either since the index was added or since the server was restarted, with a few exceptions. An index might be unique and not used at all (a uniqueness check on INSERT does not increment the ops counter). The documentation also indicates that index stats counter does not get updated by TTL indexes expiration or chunk split and migration operations. One golden rule, however, is that this type of observation based on type is subjective – before you decide to drop the index, make sure that the counter has collected for a considerable amount of time. Dropping an index that is only used once a month for some heavy reporting can be problematic. does not include this this information but it can be enabled as an additional collection parameter. Once enabled, we can create a custom graph for this information from any PMM dashboard, as shown below. As mentioned above, any index(es) that has zero values will not have been used for the current time range in the graph. One minor issue with the collector is that each metric does not come with the database and collection information. Consequently, we cannot filter to the collection level yet, we have an improvement request open for that. 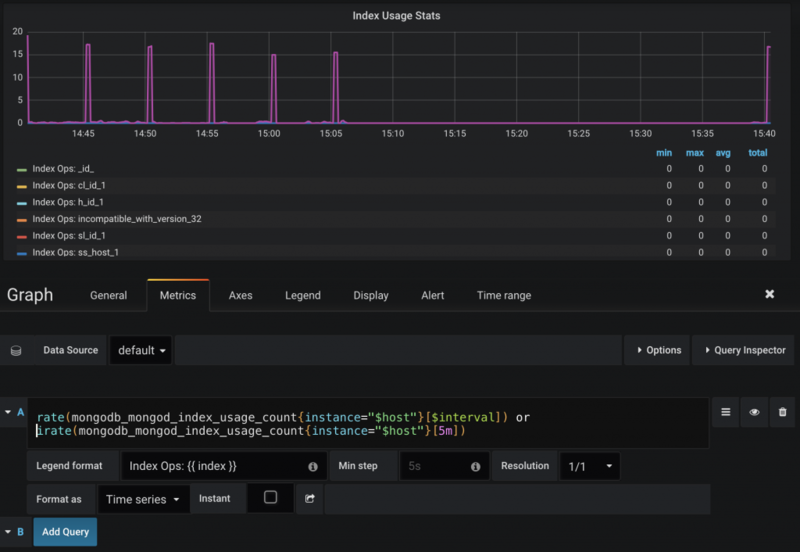 An alternative view to this information from Grafana PMM is available from the Time Series to Aggregation table panel, shown below. One advantage of having these metrics in PMM is that the data survives an instance restart. Of course, to be useful for identifying unused indexes, the retention period has to match or exceed your complete application “cycle” period. Given that in a MongoDB replicaset, you can delegate data bearing member nodes to different roles, perhaps with tags and priorities. You can also have nodes with different sets of indexes. Being able to identify the sets of indexes needed at the node level allows you to optimize replication, queries, and resource usage. We have an introductory series of posts on MongoDB indexes available on this blog. Read Part 1 here. You can download Percona Server for MongoDB – all Percona software is open source and free.